The chart shows the price movement last time Morgan reported: H1 Results, 26 July. 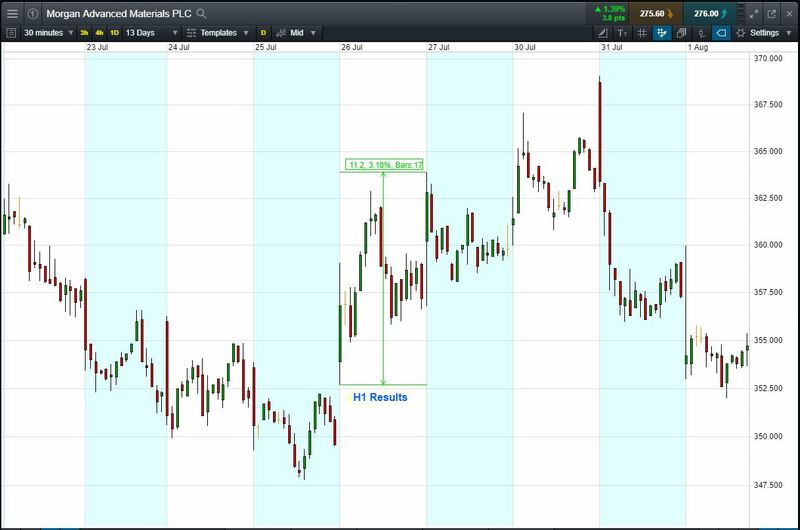 Shares opened +2.4p (+0.7%, low of the day), then went on to rise as high as +13.2p (+3.8%). The shares closed +5.4p (+1.5%) for a daily range of 10.8p or 3.1%. Morgan manufactures specialty ceramic, carbon and composite products. Results were positive, with strong H1 organic profit growth and raised FY expectations. Shares -25.6% from 2018 highs; +4.1% from 2018 lows; -19.0% year-to-date. Recent share price range: Oct lows 264p; Oct highs 338p. Currently 273p (at time of writing). Morgan publishes a Q3 Trading Update on Friday, 9 Nov.
Will we see another big move? Let’s say you think that Morgan results are likely to be good, and the share price is likely to rise. You decide to buy exposure to £10,000 worth of Morgan using CFDs, at the current price of 273p. To do this, you need £2,000. For the purpose of this example, let’s assume Morgan reports strong results and the shares rise 10%. Your profit would be £1,000, from your initial investment of £2,000. Conversely, let’s assume you open the position, and place a stop-loss 5% below the current price. Morgan results miss, it falls 5% and hits your stop-loss. Your loss would be £500.